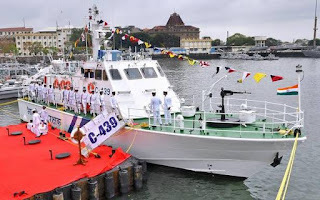 Indian Coast Guard (ICG) recently commissioned interceptor ship ICGS C 439 at Mumbai, Maharashtra. Its induction will help to further enhance operational capabilities to undertake multifarious tasks such as surveillance, interdiction, search and rescue and medical evacuations along western coast. ICGS C 439 is designed by L&T Marine & Ship Design Division, an in-house facility of Larsen & Toubro (L&T) Limited. It is 27.4 metres long and has 136 tonnes displacement capacity. It is powered by twin water-jet propulsion systems to enable quick response. It can achieve maximum speed of 45 knots. It has full aluminium-alloy hull for reduced weight. It is fitted with state-of-the-art navigation and communication equipment and medium-range armament. It is designed to perform coastal surveillance, search and rescue, anti-smuggling and anti-poaching operations in close coast low intensity maritime operations. It will be under operational and administrative control of Commander, Coast Guard District Headquarters No.2 (Maharashtra), Mumbai. Q. 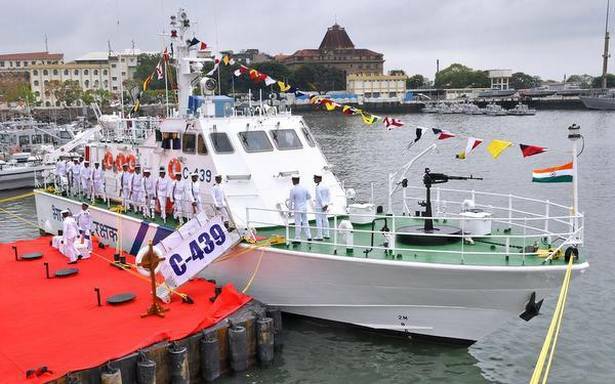 Where has the Indian Coast Guard (ICG) recently commissioned interceptor ship ICGS C 439?